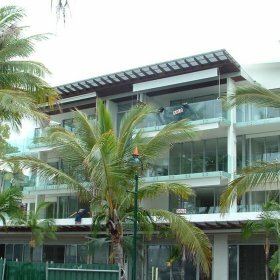 The Drift resort at Palm Cove comprises 120 three beachfront resort style apartments, including six brand new luxury three bedroom condominiums. Also included is the provision for four new retail outlets along with the existing restaurant 'Blue'. 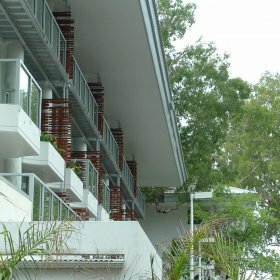 Indigo, the property developers, commissioned Lambert & Rehbein to undertake the Structural and Civil design works. 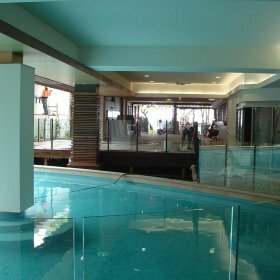 The main scope of the works includes extensive refurbishment works to the existing building, constructing a new four story apartment block, constructing a single storey retail unit, refurbishment works to the lagoon style pool and surrounding deck, and providing new tropical landscaping. Refurbishment to the existing building was undertaken using numerous forms of construction including new steel beams and columns, new reinforced concrete beams, columns and walls and new sections of reinforced block walls. The new four storey block was constructed using reinforced concrete slabs supported on concrete columns and reinforced masonry walls. New high level pad footings were also required for all of the construction.